We were so delighted to celebrate World Book Day once again. The children brought in their favourite books from home and spoke about their favourite authors. We were thrilled to welcome an author to our school Ms Amanda Kehoe and her son Tadhg and her husband Greg. 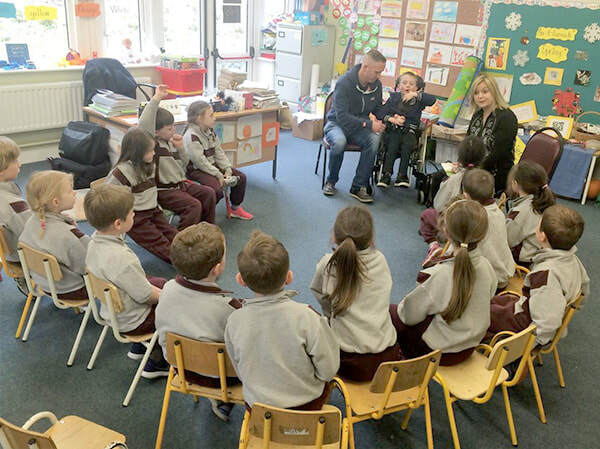 Amanda wrote the book "TJ and his Wheelable Chair" all about her son Tadhg who cannot speak and is confined to a wheelchair for a lot of the time. Amanda read her beautiful book to each of the classes and then the children asked questions about Tadhg and his life and also about being a writer and a published author. Amanda inspired the children and advised them always to persevere and never give up on their dreams. She gave us two copies of the book for our school library. 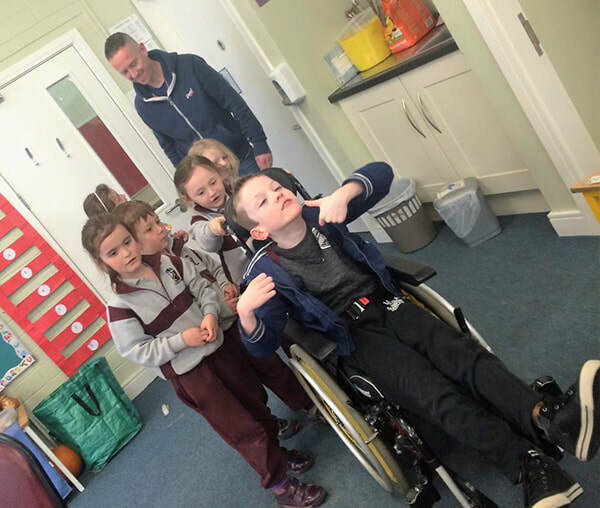 The children in Junior and Senior Infants really enjoyed pushing Tadhg around in his wheelchair and Amanda and Greg said that Tadhg really enjoyed himself. Tadhg enjoyed being wheeled around the classroom Amanda said :"The faster the better! ".